Hitachi has a global parts distribution network that makes sure you get what you need as quickly as possible. We have more than 150 dealers worldwide who provide the closest support for your needs. In most cases, your dealer will have the replacement part that you require. 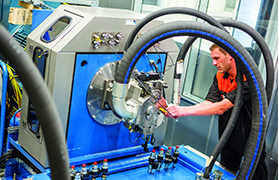 If a dealer does not have a certain part, he can order it from four fully-stocked parts depots located across the world. These distribution centers are all connected by a on-line system that gives them access to shared information on stocks, such as the number and type of available parts. The depots, which in turn are stocked by a parts center in Japan, minimize delivery time and enable you to get your parts as efficiently and quickly as possible. 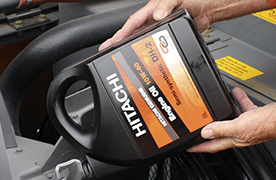 Hitachi genuine hydraulic (46HN) oil is specially designed for use in our equipment. 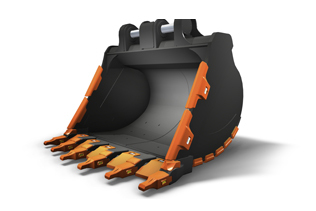 It will keep your equipment functioning at peak levels, will protect hydraulic components from wear, and will reduce your oil cost, thanks to its long life. Our genuine filters are designed to fit our strict specifications. 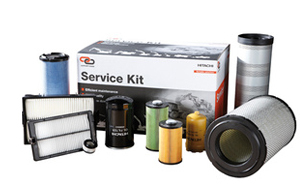 Genuine filters can reduce the potential of unscheduled breakdowns and keep your equipment running. 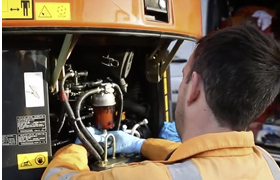 From our experience, we have found lots of cases of unexpected failures caused by using non-genuine hoses. We therefore decided to test genuine and non-genuine hoses to how they are different.